Green Screen settings now has a new UI that makes it easier to setup both when you use flash and when you don’t. You can now add more overlays to your GIFs or boomerang videos than you have frames to create an animation on top of your photos/video. Settings > GIF> Overlays. As before, overlays should be a series of PNG transparent files. Change the color of all buttons on the start screen including the Retake Button, Green Screen Start button and Full Screen button. Instead of a checkmark, guests will now see the traditional send icon when sharing via SMS or Email. Option to change the text when Email or SMS is queued has been added. Settings > Display > Text. Photoshop post processing time has been extended from 7 seconds to 30 seconds. This will allow for droplets with a large amount of layers to be processed and apply the effect to photos from dslrBooth. Refresh countdown progress circle more frequently for a smoother countdown. Trigger camera 1 second earlier so capture is not delayed due to camera mirror flipping. Add a video or audio prompt that will appear before the guest leaves their signature. Green screen now works with boomerang GIFs. Boomerang speed ranges from 50ms to 500ms. Choose a template will no longer appear when using Boomerang only. Disable spacebar when Done button is hidden. Single photos will print without printing the template. GIFs will no longer skip overlays or images. Virtual Keyboard opens with Windows 10 devices with latest windows update. Retake button no longer causes delay/lagging. Correct shutter speed is set at the end of live view. Use non-flash green screen settings when flash is not selected under Green Screen settings. Fix rare issue with GIF overlays not working on specific graphics cards. Move lock/unlock button to be above start screen virtual attendant video. Fix for retake button not working correctly with 1 photo templates. Fix for shutter speed not properly set at the end of live view on some European Canon camera models. Fix for Green Screen background issue. When uploading green screen backgrounds, the test photo or live view will now appear. 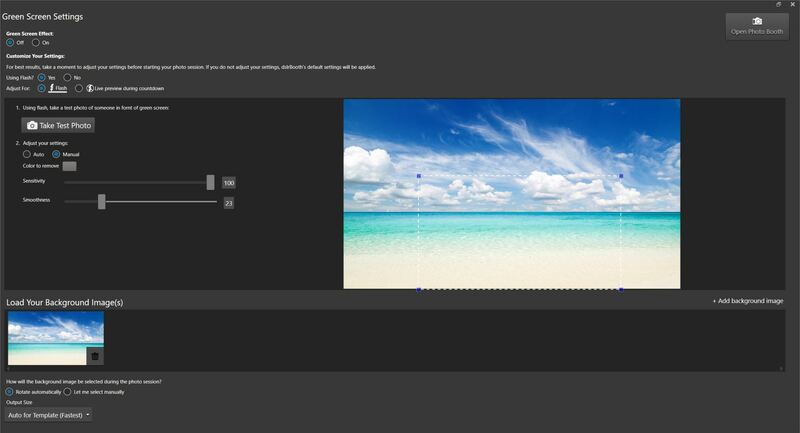 Cancel current session when entering camera settings, template editor, green screen window, and camera wizard to avoid conflict caused both at the same time. Fix for GIF overlay issues with some graphic cards. Prevent GIF sessions with 1 photo. Fix for e-mail not sending when sharing boomerang over 10MB.